Every few months some old co-workers of mine and I get together to eat lunch together and catch up. Now before I go too far, this blog has never been intended to be a site where I review restaurants, and believe me, I am not an expert so read at your own risk, but I felt like I had to post this for the locals! 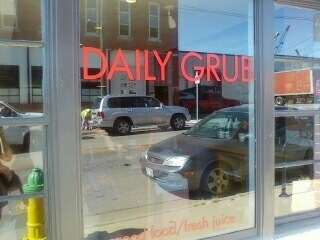 The Daily Grub on 20th and Pierce is a little piece of organic, vegan heaven! 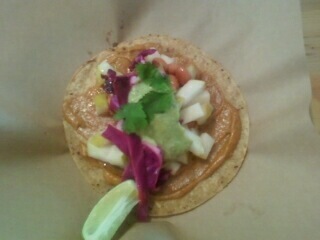 I had a friendly conversation with the lady behind the counter, explaining my situation and my need for some hand holding around what to order and she recomended the gluten free tostada. There were several soups and salads that looked good, my friend Kelly ordered the hummus sandwich, and Chris ordered the black bean soup and the beet salad. 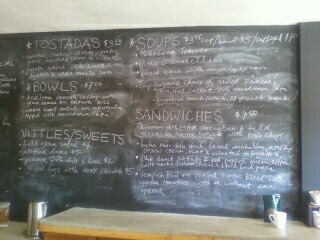 The menu varies day to day and now they are serving dinners. I am definitely making this one at my house and stopping by the Daily Grub again! Sooo good. I’ll be keeping everyone posted on the clean diet, but so far so good! What a cool little spot. I love how restaurants like this are starting to pop up. It is about time healthy eating eased its way into mainstream.